Back in 1953, Galaxy Science Fiction and Simon & Schuster launched a huge contest to find a great new science fiction novel. The prize was $6,500 (a lot of money in those days). The winner? A brand new writer named Edson McCann. Except for one thing: Edson McCann did not exist. Horace Gold was in the middle of judging a $6,500 prize competition for the best new science-fiction novel, co-sponsored by Galaxy and Simon & Schuster. The competition had been announced in the March 1953 issue of Galaxy and the deadline for submissions was 15 October. The novels Gold was receiving were generally poor and he asked [Fredrik] Pohl if he could treat Gladiator at Law as an entry if he and [co-author C.M.] Kornbluth were prepared to submit it under a pseudonym. Pohl did not think this was playing fair and declined. However, soon after completing Gladiator at Law Pohl began a new novel, Preferred Risk, this time with Lester del Rey. Here the huge corporations of the future were the insurance companies, which had refined every action and consequence down to a scale of probabilities and actuarial tables. By now the plot variations were becoming a little staid, and this novel is not a patch on the previous two. Nevertheless, Gold liked it—or certainly preferred it to the submissions he had received. He persuaded Pohl and del Rey to allow Preferred Risk to be entered under a pseudonym and it was duly declared the winner. The novel, attributed to Edson McCann, ran in the June to September issues of Galaxy. The story behind McCann was that he was a nuclear physicist who was working on top secret projects; therefore, he couldn’t risk public appearances or book signings. Such a dedicated, honorable man! 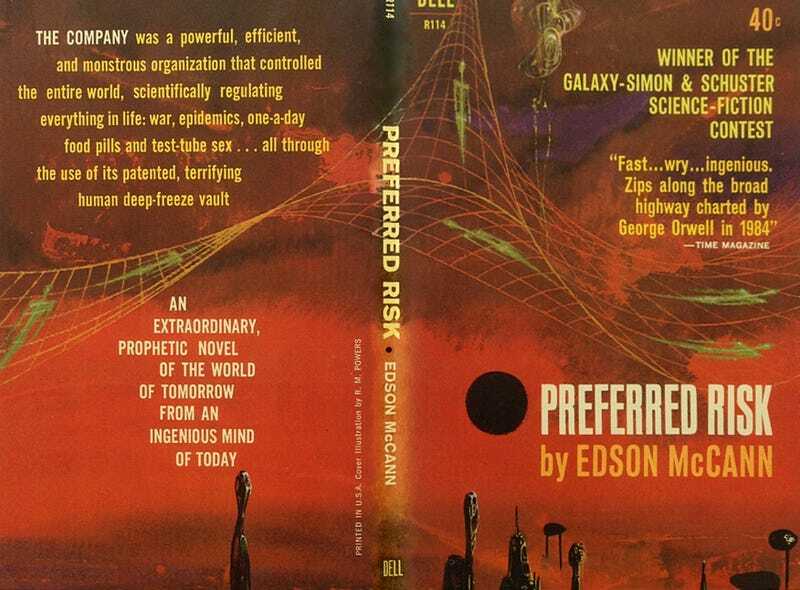 Later editions of Preferred Risk bore the names of the actual authors, and Edson McCann was able to go back to his top secret nuclear physics projects in peace.